Great opportunity to own a cabin on Grindstone Lake! Enjoy this 4 season cabin’s open floor plan, living room with a wood burning stove. 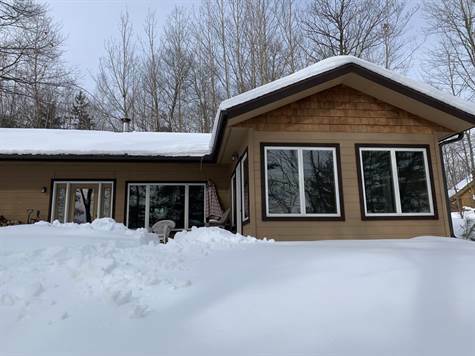 3 BR/1 Bath cabin has been completely remodeled, well maintained and is move-in ready. This cabin boasts spectacular views from the large windows overlooking the lake. Enjoy privacy on this 4+ acre lot, with a gentle elevation to the 195’ of shoreline. Cabin was designed to add on a second level if more room is desired, or tear down and build the home of your dreams on this large lot. Desired location near; dining, recreational trails, & minutes to Hayward. Sandy, swimmable waterfront.